I hadn’t seen my dad in a few weeks. My busyness got in the way of visiting the patriarch of our family. I resolved myself to open the calendar to spend some time with him. It was needed. A man shouldn’t be reduced to living a life sitting in a recliner staring into space. A man shouldn’t be reduced to having meals fed to him while wearing a bib that toddlers use. A man shouldn’t be reduced to losing all faculties of his body and mind—relying on perfect strangers for his basic needs. Yet in the shouldn’ts, many men do. My dad is in that group. This day I visited was special. The room was quiet, he was calm, his world was in order as it was the day before, and the day before that. As I sat next to him, staring into his baby blue eyes, I spoke of family matters, headlines, politics, and personal struggles. I spoke of my world and life then looked into his eyes and asked about his. Nothing. No response, only staring. I moved on from my question and continued with the details of the world outside of that room. I chatted away as if I had a captive audience. And when the details of life were all spoken, I stared back at him and silently whispered, “Please…say something.” Nothing. “Say something dad—anything, just one word, one utterance of something I can understand.” Nothing. “Oh please, it’s been so long since we’ve heard your voice, can you say just one thing?” And then he drew in a breath as if to answer; I widened my eyes and leaned into him waiting anxiously for the word to come believing in my heart there would be…and yet, nothing. And the tears came to my eyes for the remembrance in my heart that we will never hear my dad speak to us again. This man of mans, this self-reliant person who could work through anything. Now silent. All I could do was rub his hand that rested outside of the blanket. And there it happened—my special visit. Unexpectedly, he grabbed hold of my hand and wouldn’t let go—his eyes staring ahead, but his hand holding tightly with mine. And for the rest of the visit, we simply held hands. In that room, I thought of our Heavenly Father. I saw everything in the visit with my dad, the same as in my visits with God. Cluttered calendars that I clear a day here or there to sit with Him. Talk and chatter about MY life. Believing I have a captive audience to just unleash all my words at will. Begging to hear Him speak. Believing I will NEVER hear His voice again. I can’t tell you how many times I have yelled out to God, begging and pleading to hear His voice—to physically hear the words that will give me comfort when I need it the most. I have unleashed my needs and thoughts and concerns in endless words, all the while feeling as if I am talking to the walls. Have you been there? I think it’s okay to say that we have. But then, when I’m done spewing the vowels and consonants of my concerns, I sit back and suddenly realize that He has grabbed my hand. Comfort and rest washes over me and I feel the true connection. No words are needed, no back and forth—merely touch and senses that say so much in silence. We run from God so much in this life, then scream at Him when we can’t hear His voice and don’t understand the “why’s”. The visit with my dad reminded me that our Abba needs us to just sit next to Him and reach out for His hand. To stop trying to listen for an audible answer when we don’t even take the time to sit in His presence. It is then we will realize the word thru our ears isn’t what is needed; it is the Word in our hearts that solves the problems. My dear sisters, we all have different views of our earthly dads—some good, some bad—either way, an impact nonetheless. God, the Father above all fathers assures us He is always near. I know to some of you, these words seem difficult to understand when you’re in need of actual arms to hold you. However, I believe it is in that thought when God is the closest to you. There is true comfort when you call out to, and seek, Him above all others. My dad’s eyes only stared. His mouth remained closed. His ears oblivious to my words. Oh, how we view God this way. Yet in the midst of my sadness, a touch was all it took to connect. A touch, my siblings, is all it took. I challenge you to sit closer to God this week and quiet the words. A touch may happen. Read John 14:15-21. I would love to read the comments of how you see those verses applying to today’s post. Comments anyone??? As I challenged you to quiet the words, I pray you will have a moment of just you and God. Those quiet times can be some of the most comforting times of life. Will you? Nice to hear from you Aunt Vi! I am so glad the words reached you at the time you needed them. It’s true, isn’t it–about not being able to understand or hear Him when we need it the most. But as scripture tells us, it’s the quietness that sometimes answers our calls. Thank you for commenting!! Luv you too. It is hard to put in words how I felt when i read this. Many emotions past through me. I even thought of my father-in-law many times in the hospital when I would hold his hand and he would talk to me about things. many times I wish that I could do the same things with dad but I also sit there and think what he would say to us if he could talk right now. When I get down about dad i do open the most wonderful book around and find anything that can help ease some of the pain. thank you for writing about our father. When I was reading it it also reminded me of when you had gone to a women’s retreat and you had told us about how the Lord did talk to you and held you in His arms. You have experienced the Lord talking to you and letting you know how much He loves you. that right there is a blessing. It still amazes me how you can take such an ordinary thing and put such beautiful words to it. You are truly blessed. Thank you Renae, beautiful words! As a few of those who have posted said the tears flowed while reading this, so it was for me. I have had those moments with dad when you want so much for any sign of recognition, you look into his blue eyes, you wait for a smile or sign that he knows who you are, or a little wave that would mean so much. You wait… and nothing! I am guilty of so many times questioning why he is still here, what purpose does it serve for him to JUST EXIST, time for him to go “home”. But as mom reminds me it isn’t our decision or what we want, there is a reason for it. My faith isn’t as strong as yours so I want to scream what possible reason is there. When I hear from you or mom that you have had “a moment” with dad or I myself have had one I back off from those thoughts and think we are lucky to have another moment with him. Hearing your words gave me something else to think about, time for me to listen to the silence maybe. Love you, thank you and Raye for your posts I do enjoy reading them. Think mustard seed…. (and I’ll leave it at the message I already sent you). thank YOU for sharing here! You are welcome Elaine–thank you! wow… I’m speechless Renae… this weekend I’ve been thinking a lot about my dad… He is in South Carolina and I haven’t seen him in a very long time… your message was powerful and the photo sent chills through me… I’m still in awe of the power I felt coming through… thank you for sharing such a special moment giving us a special moment to embrace through you… Love you!!! You are welcome Shirl! Words truly do have power and I am glad that we all can lift each other up with messages. (I saw the picture, your daddy looked handsome in his uniform–cherish those precious times of togetherness). Renae, thank you for the beautiful word picture of something so personal and so spiritual. 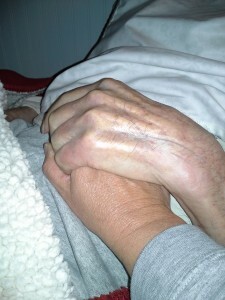 I love that you found so much comfort in just the embrace of your Dad’s hands. I,too, struggle with the need to ‘hear’ from God; a gentle reminder or a loud command. I’d settle for a text message though! Thank you for the reminder that just ‘being’ with our Lord is oh so valuable. Meredith, you have always made me laugh! I would LOVE a text message–wouldn’t that be cool? I’ll even take one in crazy text language, too. Thanks for sharing. Great verse Mimi! The immeasurable amount of what he does more than all we ask…. God is great! The stillness of life without words is deafening. But the look you got from his eyes and the clasp of his hand was a symphony perfomance to your heart! I tell you I would give alot to have that with those I have deeply loved and now have lost. . I cherish the still quiet of Jesus’ presence in my life when I doubt and don’t understand. Thank you for sharing your moment with me. I am comforted and encouraged! Diane, I am encouraged by your strength and words too. You are right, the still quietness of Jesus in our lives is a gift beyond words. thank you. The lump is still in my throat.. Thanks for the moment with your dad, I know it must have been special, but sad, at the same time. I also, only holds hands with my husband but those moments have always mean’t so much to me since that is our only means of communicating. He feels my presence and I feel his warmth. Thanks for John 14:15-18,God is always present, He loves us and our need is met in those small quiet moments, He is with us and in us, it is up to us to allow Him into our daily thoughts and actions,and thank Him for His goodness. “Vye”–you are spot on, it IS up to us to allow Him into our daily thoughts and actions, –that choice remains every day, every moment. Again you begin my morning with tears but also with peace and comfort. My Mother In Law just recently got diagnosed with Alzeihmer’s so we are just beginning this journey but oh how you just gave me hope! Love the scripture too, we are studying the Holy Spirit in WOF and I have learned so much about His presence in our lives, amazing. Thank you for sharing this very intimate time with your Dad, very precious. Karen, the journey your family is embarking on with your mom-in-law will be a road filled with highs and lows. Hang on to the times of togetherness and stick close to Jesus–He is the only way to navigate through it. And I agree–the Holy Spirit rocks! Those scriptures bring me comfort in knowing that God has provided me with a helper that is always there, always guiding me, and reminding me of my heavenly father’s perfect love for me. Great story Renae and thank you for sharing something so personal with so much spiritual application! What a blessing God answered your prayers with contact from your dad. Sometimes silence is incredibly profound with a warm embrace. Thank you Lori. Isn’t it wonderful how He left us with a “helper”. God always provides. And yes, silence is incredibly profound with a warm embrace!